For the past decade, Dakota has worked at the intersection of business and social impact—driving measurable change across multiple sectors, including health, agriculture, education, and environment. Dakota is an expert engagement and leadership development strategist, who coaches clients to communicate effectively and collaborate to maximize their potential. 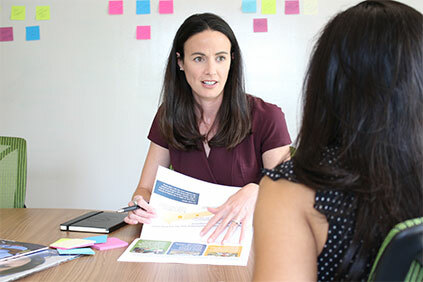 Whether she’s advising organizations on how to pitch for funding or leading workshops on the power of partnerships, Dakota guides clients on the ideation journey—inspiring big ideas and developing the strategy to make them a reality. She captivates her audience through stories and delivers challenging content in clear and concise ways. Dakota has led the development of strategic partnerships and resource mobilization efforts for organizations seeking to expand their influence and reach in both domestic and international spheres. Most recently, she designed a private donor engagement strategy that resulted in a quarter of a billion dollars in commitments for health-related issues in the Asia-Pacific region. As part of this work, she also sourced and managed a multi-million-dollar grant portfolio to scale technological innovations advancing healthcare in the region. As a stabilizing presence for clients, Dakota is often brought in to guide teams through leadership transitions, mergers, and other organizational shifts. She fosters a sense of teamwork and collaboration, while instilling confidence in clients as she charts the course forward during times of uncertainty. Prior to joining Geneva Global, Dakota worked at the World Bank as part of the Agriculture and Environmental Services team, where she collaborated with financial institutions throughout Africa and Asia to increase their agriculture lending capacity. At the University of Pennsylvania’s Wharton School of Business, she managed partnerships, international events, and research projects for a corporate sustainability initiative. She holds a Master’s degree in Environmental Studies from the University of Pennsylvania and a Bachelor’s degree in Metropolitan Studies from NYU. Being part of a team that is dedicated to driving positive social change on a global scale. Together, we create and implement solutions addressing some of the most challenging global health and development issues. Random Acts of Kindness, homemade guacamole, sporting events & underdog victories, unexpectedly hearing my favorite songs on the radio, Will Ferrell, and spending time with family and friends. Keep an open mind. And bring a scarf – it can be a pillow, blanket, beach towel, eye mask and a fashion accessory!